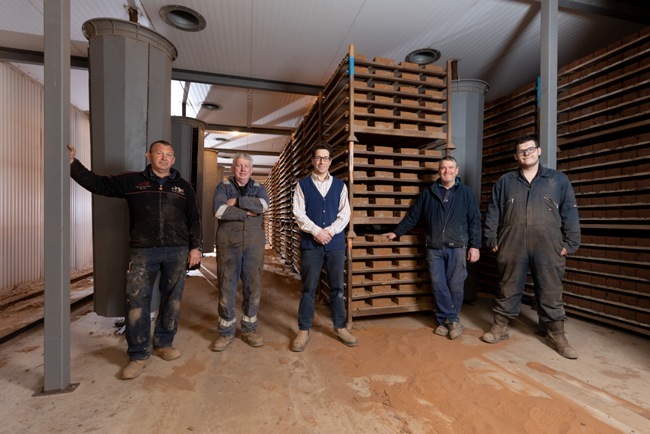 York Handmade Brick Company has invested in a brand-new brick dryer – designed and built by production manager Steve Pittham. Steve, who has been with York Handmade since it was founded 30 years ago, created the state-of-the-art dryer from scratch. The dryer is capable of handling more than 33,000 bricks at a time, significantly speeding up York Handmade’s production process and make the company even more efficient. Steve Pittham said: “Our previous dryer had run its course and just wasn’t capable of handling the pressure of our increasing order book. We had the choice of buying a new one or building one ourselves. I liked the challenge of the second option and I am delighted it has worked out so well. Steve explained that a fast and efficient dryer was a crucial part of creating handmade bricks. All clay bricks, when formed, contain water. That is what makes the clay flexible enough to shape. This water must be removed before the bricks can be fired. The process must be carefully controlled so as not to stress the product, which could lead to distortion and cracking. York Handmade’s new dryer can now remove 4,000 gallons of water at a time. The rate at which a brick dries is controlled by adjusting temperature, humidity and air movement. A typical drying cycle starts with low temperature (around 30 degrees C) and high humidity and ends with high temperature (up to 120 degrees C) and low humidity. The movement of air, controlled by fans, is used to help evenly distribute the air around the product and remove saturated air. The introduction of the new dryer comes at a time when York Handmade is extremely busy. Upcoming projects including a £300,000 contract to build a new library at Magdalene College, Cambridge; prestigious housing developments at Lancer Square in Central London and King’s Cross; and a significant restoration project at St Albans Cathedral. David Armitage added: “Looking ahead, it is encouraging to report that brick remains the building material of choice for many architects and specifiers across the UK. Providing the economy doesn’t implode, we anticipate a very successful and enjoyable 2019.